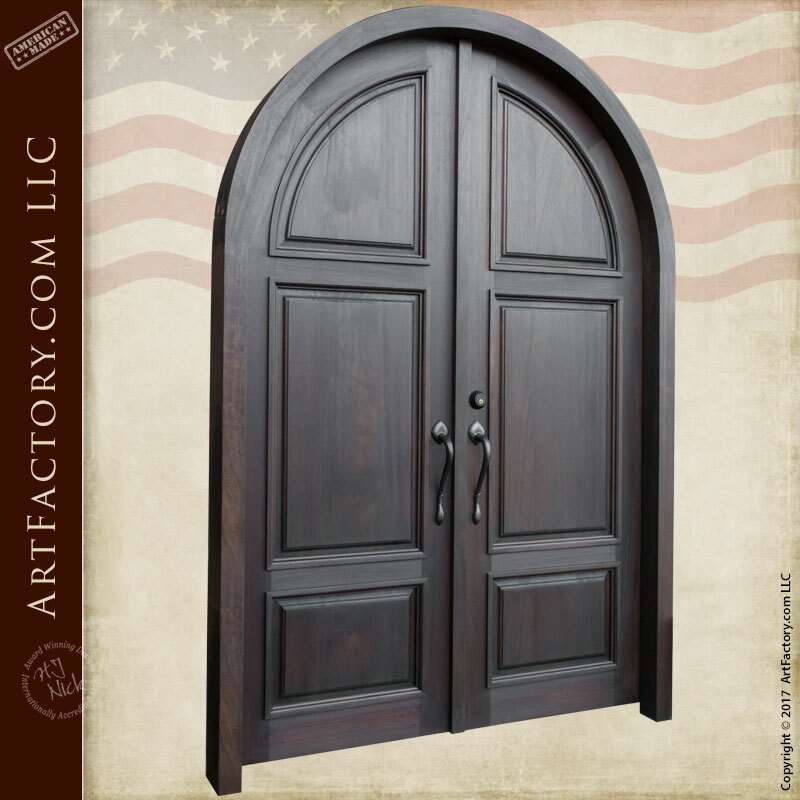 Arched European Villa Double Doors – Custom Solid Wooden Doors- Our newest hand crafted door will invigorate your home with classic 15th century design. Featuring exquisite curves that capture the magnificent beauty of European design, your custom wooden door is air dried and hand finished to remain durable and weather resistant for generations to come. You’ll never need another door. Inspired by the Villa Medicea in Prato, these European-inspired Arched Double Doors are crafted using only old-world techniques. Using techniques of the past – real blacksmithing and mortise and tenon joinery – is the only way to create a custom wooden door that becomes a cherished family heirloom. Every home owner needs at least one custom wooden door that he or she can truly cherish. All of our products are affordable and created just for you. We’re so confident in our fine craftsmanship and the durability of our products that we guarantee everything forever – no questions asked. Our exterior wood doors are custom handcrafted in the original craft and are not reproduction fast process doors. Our master-level craftsmen, wood workers, and blacksmiths use their classical training and artistry to hand build our doors using historically correct methods that have been tried and tested throughout history to last for generations. Using the correct building methods and tools as the historic design, we can recreate a design specific for each client’s need for maximum security and an investment quality entrance door. Scottsdale Art Factory offers only the finest quality, artistic signature doors and entrances, individually created by our expert craftsmen, wood carvers, and metal smiths; with no limitations on size, design, thickness or finish. We hand make interior and exterior doors in any style – limited only by your imagination. Guaranteed “Forever” no questions asked. Virtually maintenance free built to two times the hurricane code. Our doors allow for maximum security that will last forever. Contact us to discuss your designer door ideas at 1-800-292-0008. Scottsdale Art Factory, a custom wood doors, wrought iron gate, and handmade furniture manufacturer based in Scottsdale, Arizona, and Designs by H.J. Nick, have been designing and building some of the world’s finest furnishings all hand crafted in America since 1913. Most of our clients want a furnishing that has a Big WOW factor and timeless elegance. They all want investment value furnishings that make a proper statement reflecting their personality, or the personality of the environment for which the designer custom furnishings are intended. Call us to discuss your custom wooden doors design ideas 1-800-292-0008.